With a firearm in one-third of American homes with children, it's very likely that, as a parent, you’ve thought about gun safety for your child. This statistic comes from Asking Saves Kids (ASK), a national campaign that encourages gun safety – something that may seem intense for a child, but is absolutely necessary. Children are naturally curious. To learn about the world, they gravitate toward the new and interesting, especially things that often get portrayed as "taboo" like drugs, alcohol – and guns. Though it can be a nerve-racking discussion, an important part of preparing your child to be an adult is teaching them how to think about guns when they do encounter one, whether it’s in your home or someone else’s. The ASK campaign promotes one simple idea to help with this conversation, which is to ask one very critical question: "Is there an unlocked gun in your house? Parents and caregivers need to ask this important question before deciding whether to send a child to someone’s house to play. Conversely, if children are coming over to your house, it’s also important to tell the child’s parents that you keep a gun in the home. Keeping kids safe takes communication by everyone involved. But what if you want a gun-free household? Your child will see guns in the movies and on TV, and they'll likely come into contact with one at a friend or relative’s house, given the statistics. That’s why properly educating your child on gun safety is a lifesaving skill for all children. This guide shares the best ways to ensure your family knows how to properly handle guns, whether you keep them in your house or not. Use a safe. While gun safety education benefits children, the best way for you to ensure children don’t handle your guns unattended is to store all firearms and ammunition in a safe. You can find gun safes of all sizes, including small and affordable options that fit into a nightstand. Digital keypads or biometric touchscreens allow you to get your firearm quickly. Know where and how to secure firearms. Only adults who use the guns and ammo should know where and how to access them. Any gun, even stored in a safe, should be unloaded when you’re not using it. Do it now, not later. If you carry a handgun outside the home, make it a habit to immediately put your gun in a safe as soon as you return. Don’t put it down on a table with the intention of storing it later. You may forget. If you choose not to have firearms in the house, your child will likely come into contact with a gun at someone else’s house – which is why you still need to educate them on proper gun safety. Guns are like alcohol or drugs. As a responsible parent, you need to educate your child before they come into contact with a firearm when you’re not around. If they know exactly what to do, their chances of acting safe and responsible go up considerably. Thanks to modern innovation, there are many safe and secure ways to store your firearms and ammunition. 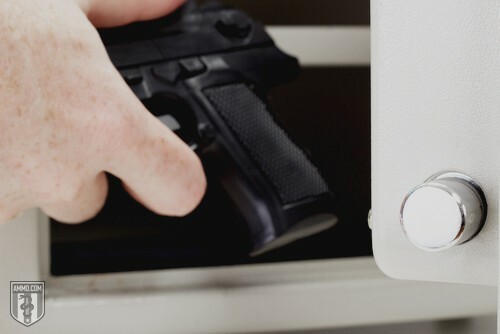 Biometric gun safes utilize fingerprints, a uniquely identifying feature of an individual, to lock and protect firearms and ammunition. They provide the highest level of protection, prevent unauthorized entry, and are designed to enable only those with stored fingerprints in its database to gain access. Because all you need are your fingerprints, you don’t have to carry a key, recall a code or try to nervously key a combination in an emergency – making them quick, reliable, accurate and easy to use. The Downside: Biometric safes need electricity to power reading units, storage and other components. If the electricity goes out, or your battery goes dead, you can be locked out of your own safe. To avoid this, opt for a biometric safe with a key override feature. And be sure to keep the reader clean and free from damage to avoid technical problems. We Recommend: One of the top models available today is the Barska Biometric Safe, priced around $175. It is capable of storing a few small guns and works well for households and offices. You can mount it anywhere for fast and easy access when you need it most, great for use in emergency situations. You can find a variety of multi-gun safes on the market. However, Stack-On gun safes are considered the best out there. They are affordable, well built and meet all the government regulations and certifications you need to securely store all of your guns. All Stack-On multi-gun safes are tested to withstand fires up to 1,400 degrees (Farenheit) and they are sturdy enough to handle falls and bumps. The Paragon 7550 8 Safe for Gun Rifles is the top gun cabinet under $500, because it comes with an ample amount of security and space for storing up to eight guns. It can also anchor to the wall or floor. Two other affordable models that are high-quality include the Stack-On GCDB-924 10-Gun Double-Door Steel Security Cabinet and the Homak HS30003630 12-Gun Security Cabinet, Silver Vein. Most gun cabinets of yesteryear don’t come with locks and other security features, but the new, modern ones do. Opt to buy a recent model for better security and safety. If you must go for an antique model, be sure to equip it with the best locking mechanism you can find. If you want to keep your gun loaded and in an easily-accessible place, yet you also want to keep it secure, the Safety Bullet is a great tool. It allows you to keep a custom-made "dummy bullet" chambered first that makes your gun unusable if accidentally fired. All you have to do is cycle your gun to remove the Safety Bullet, and then it's ready for live action. Watch this short educational video from Safety Bullet's creator to learn more. No matter what type of gun safe you opt for, consider anchoring. Every safe comes with a hole on the bottom to easily anchor into concrete or wooden floors. This safety step keeps your safe secured in place, preventing theft or relocation for easier access. It's important to also ensure that your safe is well hidden and not easy to find. Sit down with your children and have multiple conversations on guns and gun safety. Establish family rules for how to handle the presence of guns in any situation. How soon should you start? The answer depends on the comprehension and maturity level of your child. Remove the romance. Talk about how television, movies and the internet often romanticize guns, and explain how it is not reality. Provide the facts. Talk about how many people each year are injured and killed by firearms. But also explain their main uses – like for the police to maintain order, for hunting and for personal protection. Talk about unsafe neighborhoods in your town or city. Discuss unsafe neighborhoods and areas with high crime rates that your child may need to avoid. Bring a buddy. Tell your child to use the buddy system for safety by never going anywhere alone. No secrets allowed. Give your children a safe space to tell you about bullying or other threads of violence that they encounter. Nurture a healthy respect for firearms. Give your child the tools to be smart around guns. If your family likes to go on hunting trips, for example, make sure your child knows the difference between using a rifle out in the field and leaving a rifle unloaded and locked away safely at home. Know and teach children gun laws. Lead by example, and practice good safety habits regarding ownership and ongoing storage. Ensuring your child remembers these four things can help protect them if there is a gun present without proper adult supervision. Field & Stream provides practical insight, suggesting a bucket list of ideas such as training at the range and shadowing seasoned gunmen first before children use guns on their own. For a woman's point of view on gun instruction, read what The Well-Armed Woman has to say about introducing children to guns. The NRA, along with "Eddie the Eagle," give parents advice on discussing firearms and the need for respect and safety when around and using guns. The Kids Health site gives insight on diet, exercise, and domestic security. Read what you should do if you have guns in the home, how to discuss firearms and home protection with kids, etc. At first glance, guns can be a scary topic for many parents. But with knowledge and discussion among your family, you can keep everyone safe. Common sense, a bit of gun safety know-how, and an open conversation with your children can create a lifetime of respect for firearms. Just remember – keep your guns locked up and always ask: "Is there an unlocked gun in your house?"